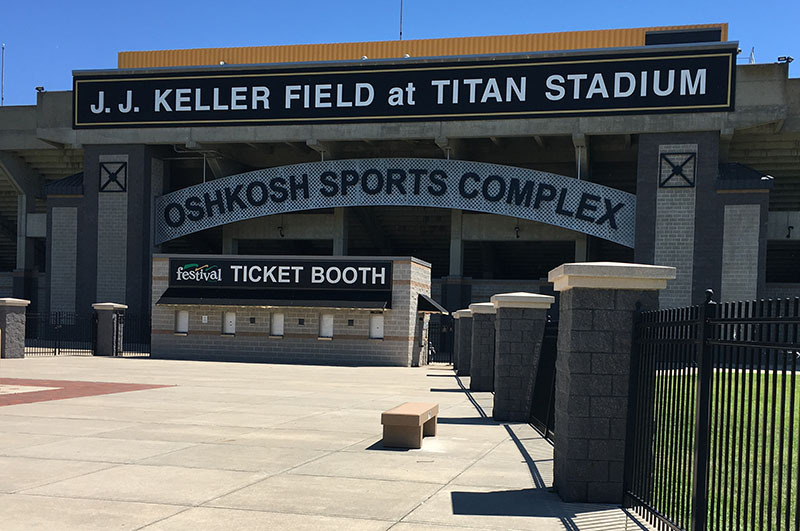 As of late last month all of the debt has been paid off on the Oshkosh Sports Complex. On May 31 the UW Oshkosh Foundation sent a final payment off to Wells Fargo Bank, retiring the debt on the Oshkosh Sports Complex and putting the 34-acre facility entirely under the ownership of the UW System Board of Regents. Meanwhile the foundation is negotiating the sale of a biodigester it built at Rosendale Dairy, and it has accepted a contingent offer on a house on Congress Avenue that had been used as a residence by chancellors of UWO. As these steps indicate, the university’s independent fund-raising arm, which took refuge in bankruptcy proceedings last summer, is slowly but surely unwinding the real estate projects that are central to a controversy that has roiled the campus and sparked legal proceedings in Milwaukee, Madison and Oshkosh. Meanwhile the foundation has been fulfilling its mission of providing financial support to the university, most recently winning bankruptcy court approval in early May to disburse $1.3 million, including $818,390 for scholarships, to the school. The foundation controversy has been a headache and a huge black eye for the university, but as progress is made on cleaning up the real estate deals that are at the heart of the matter, some longtime university boosters are questioning whether it was a self-inflicted wound that will cost the school dearly in terms of wasted time, bad publicity and legal fees. More importantly, these boosters say, the handling of the controversy has meant the loss of the goodwill--and possible future donations--of some of UWO’s most loyal and generous alumni. Donations have already declined significantly. During the five-year period from 2011 to 2015, the foundation collected an average of almost $5 million a year in grants and contributions, according to the most recent publicly available tax returns. The university, which has recently started fundraising on its own, took in just $420,803 from the time when news broke about the the foundation's finances in January 2017 through April 27 of this year, according to university data released in response to a public records request. For now attention is turning to former Chancellor Richard Wells, who along with a top lieutenant, is scheduled to make an initial appearance June 11 in Winnebago County Circuit Court to face criminal charges of misconduct in office. The charges, filed just weeks before the university was scheduled to host outside reviewers who have been examining its accreditation status, mark an abrupt about-face for the state of Wisconsin. Earlier this year Attorney General Brad Schimel entered into a stipulation agreement with Wells and his top financial aide, former Vice Chancellor Tom Sonnleitner. Schimel agreed to stay a civil case against the UWO leaders while various courts try to sort out whether they had made legally binding promises that could force the state to bail out the foundation’s real estate projects. Schimel said in a court filing that the situation was so unclear that Wells and Sonnleitner could be “potentially found to be liable for some, none or all of the Board [of Regent]’s claims alleged” against the retired university officials. “The criminal charges filed by the Wisconsin attorney general’s office against the former chancellor and vice chancellor of UW Oshkosh have the smell of prosecutorial overreach, scapegoating and missing of the mark,” wrote Milwaukee businessman and blogger John Torinus in a column that was published on the Urban Milwaukee website. A spokesman for Schimel declined to comment. An attorney who works with one of the largest groups of criminal defense lawyers in the country said there are at least two major problems with the charges against Wells, assuming that Wells has the financial ability to mount a defense and does not agree to a settlement. The first is that any evidence that was developed as part of the state’s initial civil case will be subject to procedural challenges and could be ruled inadmissible. The second problem, according to this attorney, is the legal doctrine of “mens rea,” which holds that a person cannot be convicted of a crime unless the defendant acted with a “guilty mind,” with knowledge of the wrongfulness of an action. In Wisconsin, this concept applies to the state’s law on public corruption based on the language of the statute and the way it has been interpreted by state courts. The basic charge against Wells and Sonnleitner is that they exceeded their legal authority by signing loan guaranties and other documents to secure financing for five real estate projects. There is little question that they did sign these documents, although there could be a technical problem in that the papers they signed may not have been in the proper form to qualify as a legally enforceable guaranty. The question of intent is the major impediment that the state will have to overcome to gain a conviction. The Wisconsin Court of Appeals addressed this issue in the case of Scott Jensen, the former Republican speaker of the General Assembly leader who was first convicted of three felony charges but then was largely exonerated of accusations that he improperly used state workers to engage in partisan campaigning. In throwing out Jensen’s conviction, the appeals court noted that the state must not only prove that illegal acts were committed but also satisfy two other provisions. Citing a Supreme Court case, the Jensen appeals court noted, "[T]he statute provides, as separate elements of the crime, the requirement that the conduct be `inconsistent with the duties of [one's] office' and the requirement that the conduct be done `with intent to obtain a dishonest advantage.'" In the civil case, Wells has argued that any actions he took as chancellor “were performed within the scope of his employment and as part of his official duty.” These actions, “if not undertaken with actual authority, were undertaken with apparent authority derived from the Board [of Regents], the relevant statutes, administrative code provisions, policies, practices, procedures and traditions of the [UW] system, the doctrine of agency and the common law,” Wells said in his response to the civil charges. His actions “do not constitute intentional or negligent conversion,” Wells argued. A critical piece of evidence supporting the former chancellor’s position is that the loan guaranties were discussed in the presence of the UW System vice president for finance, who was also a board member for the UW Oshkosh Foundation. The vice president, Deborah Durcan, refused to be interviewed by retired Judge Patrick Fiedler, who was commissioned to investigate the foundation’s real estate deals. Fiedler found that the foundation’s board relied on Durcan’s “silent acquiescence” during discussions about the projects to conclude that the loan guaranties were acceptable. But this statement was later contradicted in a study by the Legislative Audit Bureau, which found more than 2,000 transactions in which a UW school paid money to an affiliated foundation. The system argued that these payments, which occurred over a period of seven and a half years, were different from the loan guaranties arranged by Wells and Sonnleitner. But the public record shows that the UW Board of Regents did specifically approve on multiple occasions the transfer of funds from the university to the foundation. For example the board OK’d a contract extension with food service provider Sodexo that specified that the company would make a series of payments totalling $1.5 million that the university would use for “build-out” of the foundation’s Alumni Welcome and Conference Center. That building is in an odd state of limbo. The foundation always intended to give the building to the university and tried to at one point. But the paperwork was not completed correctly, and so ownership continues to rest with the foundation. The university, however, is using the structure as if it owned it, renting it out and covering the operating expenses. In 2015 the school lost almost $165,000 on operations, but over time the facility has operated close to a breakeven basis. It is on track to earn a small profit this year. One of its biggest users is Oshkosh Corp., which has paid the university almost $150,000 since 2014, according to reports obtained under the Wisconsin public records act. UW System officials declined to comment for this article.